Blind since the age of nine, Fidler is a St. John’s composer, musician and recording artist — a “painter of sound,” he says. He’s also deeply insightful and more positive than most, although he insists he’s not any more interesting than anyone else. “We live in a competitive society that kind of elevates some people, like celebrities or royalty, while denigrating others,” he says. “It’s really a fallacy, because every single person has a spirit and a story. Circumstances make some people’s stories seem more fascinating or TV-worthy than others, but every single person has just as valid a story. With five albums under his belt — on which he plays at least a dozen instruments, on tunes in English, French and Arabic — Fidler’s music simply cannot be classified. Reggae, pop, Celtic and Amerikana are recurring influences, but his style is his own, perhaps stemming from his broad view of the world. Lillian says it was difficult to capture the breadth and depth of Jim in words. She’s beginning with the moment he lost his sight and had to leave his family to go to Halifax’s School for the Blind. Jim remembers the day doctors removed the bandages from his eyes and told him he’d never see again. “It was like if I put bandages on your eyes and put you in a dark room and took the bandages off — everything was painted with white silver,” Jim explains. “I remember seeing that, and it didn’t dissipate. Was I scared? No. What was I going to do, really. I couldn’t change it and there was nothing I could do about it. Jim attended the School for the Blind from 1974 until 1983, only returning home for Christmas and summer vacations. It was a 15-acre estate, he says, with grand pianos and a pipe organ that he could play whenever he wanted. It was also where his love of music began to develop and flourish. He studied classical piano and music theory at the Maritime Conservatory of Music as an honours student, and went on to win many awards and nominations for his music, as well as a European record deal. The School for the Blind was torn down in 1984, and Jim and Lillian recently got an email from organizers of a ceremony to commemorate the school, set to happen Sept. 28. 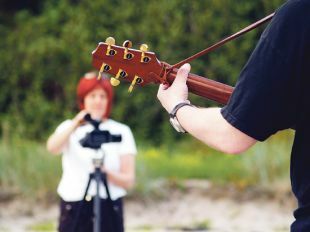 Lillian hadn’t planned on travelling to Halifax for her film, but once Jim was invited to perform at the ceremony, she decided she couldn’t pass up the chance to add a new dimension to the piece by interviewing his first music teacher, bandmates and friends from the school. In order to get there, the couple has set up an Indigogo website, where the public can contribute to the funds needed for them to travel to Halifax and complete the documentary. The site has seen a fantastic response so far, with more than $1,200 of their $3,000 goal raised. Contributors receive perks in exchange for their contribution, ranging from Jim’s latest single, “We Need a Revolution,” to their name in the film’s credits as executive producer. Lillian has already started putting together bits and pieces of the film, including a trailer on the Indigogo site. She has included a “W5” clip from 1973, in which Jim is visited by children’s television star Uncle Bobby (Bobby Ash). Jim had developed a friendship with Bobby, and had invited him to come to Newfoundland for a visit before he went to Halifax. Bobby came, bringing a TV crew with him. In the clip, in which Jim and Bobby walk along Topsail Beach, Jim talks about the things he’ll miss from home while he’s at school, and gives a message to other children. Thirty-nine years later, Jim’s message hasn’t changed much. He hopes that by performing at the tribute in Halifax, he might inspire others to come to terms with things in their lives towards which they might hold resentment. “I’m going to sing my song, and hopefully you’ll maybe feel a little bit of energy from me doing that and it will even make you say to yourself, ‘That’s my brother there,’” he says.